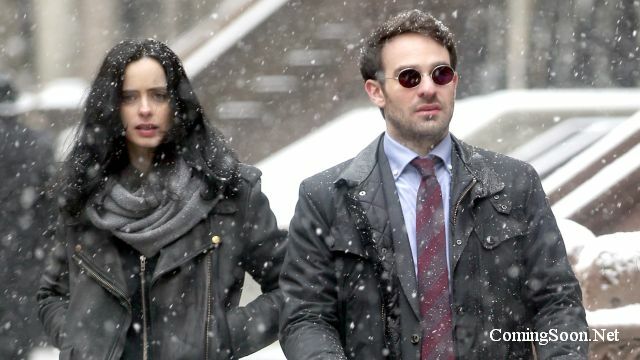 Even more photos from the New York set of Marvel’s The Defenders have surfaced online and feature stars Charlie Cox and Krysten Ritter in a new type of environment for the heroes of Hell’s Kitchen, a snowy New York! Check them out in the gallery below along with all of our previously-released set photos featuring a reunion of Jessica Jones and Luke Cage in the anticipated Netflix series. You can view the almost 30 new photos of Krysten Ritter (Jessica Jones), Mike Colter (Luke Cage), Jessica Henwick (Colleen Wing), and Sigourney Weaver (Alexandra). The Defenders stars Charlie Cox as Matt Murdock/Daredevil, Krysten Ritter as Jessica Jones, Mike Colter as Luke Cage and Finn Jones as Danny Rand/Iron Fist. In addition, Elden Henson will be reprising as Foggy Nelson along with Deborah Ann Woll as Karen Page, Eka Darville as Malcolm, Carrie-Anne Moss as Jeri Hogarth, Scott Glenn as Stick, Jessica Henwick as Colleen Wing, Elodie Yung as Elektra, Rachael Taylor as Trish Walker, Simone Missick as Misty Knight, and Rosario Dawson as Claire Temple. It has been hinted that Jon Bernthal’s The Punisher will return for the series as well, but that remains unconfirmed. Sigourney Weaver will play the antagonist of the series known only as Alexandra. Marvel’s Daredevil co-showrunner Marco Ramirez will serve as showrunner and executive producer for the series along with Drew Goddard, Jeph Loeb and Jim Chory. Director S.J. Clarkson (Marvel’s Jessica Jones, Dexter) will direct the first two episodes of the culminating mini-series event. The eight-episode series will premiere in 2017 along with Marvel’s Iron Fist and Marvel’s The Punisher.